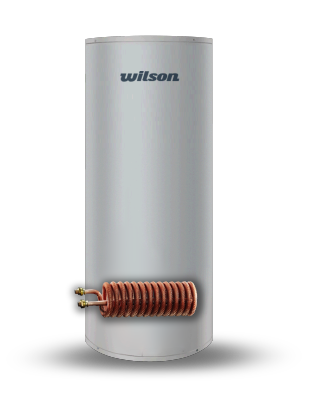 The new Wilson Hot Water ThermaCoil stainless steel tank is among the most efficient heat exchange mains pressure tanks available. ThermaCoil is the ideal vessel for heating domestic hot water from renewable energy or waste heat sources with the highly efficient finned tube heat exchange coil designed to deliver as much energy as possible into the ThermaCoil tank. The coil is replaceable and installed via a flange on the side of the vessel. The finned tube coil can be used to ‘load’ the vessel with energy while domestic hot water (DHW), hydronic heating etc. will ‘unload’ the cylinder of energy. Multiple coils can be placed in the vessel…as a back up source of energy a 3.6 kW electric element is fitted as standard. Using German manufactured heat exchange coils installed in Australian made stainless steel mains pressure tanks you can be assured the ThermaCoil is of the highest quality providing reliability and durability.